From left to right: Brgy. Captain of Silang Cavite, Romeo Toledo, Usec. Catalina Cabral, Mayor Omil Poblete, Sec. Mark Villar, Mr Luigi L. Bautista, Mr. Jeffrey Ng, Atty. Ronald Uy, and Mr. Christopher C. Lizo. Silang, Cavite – The Department of Public Works and Highways (DPWH) Secretary Mark Villar awarded the Original Proponent Status of the Cavite-Tagaytay-Batangas (CTBEX) to the Metro Pacific Tollways South, a business unit of Metro Pacific Tollways Corporation, a subsidiary of the Metro Pacific Investments Corporation. It was in July of 2017 that MPT South submitted the proposal to DPWH with the objective of reducing travel time of motorists going to Tagaytay and Nasugbu from Manila and vice versa. CTBEX will connect seamlessly with the Cavite-Laguna and Cavitex Expressways of MPTC and will reduce vehicle operating costs, improve communities through employment and income growth from land development and improve urban setting, as well as increase tourist visits to the municipalities which will be traversed by the alignment. “We are glad to award the original proponent status to MPT South, their commitment to nation-building is commendable. CTBEX will decongest approximately 23,000 vehicles daily from existing thoroughfares. Moreover, with CTBEX, travel will be seamless via MPT South’s network of tollroads. Mapping out the routes, access to region 4A may start from C5-Southlink in Taguig connecting to CAVITEX, CALAEX then CTBEX and from Manila via CAVITEX, CALAEX then CTBEX. Our doors are open to any developer with viable proposals, after all, now is the golden age of infrastructure as we find more routes that pave the progress of our Nation.” Said Secretary Mark Villar. The project is expected to provide congestion relief to Aguinaldo Highway and Tagaytay Nasugbu road, where traffic is expected to grow by 4% annually over the next decade. Travel time will be shortened in 2 major routes namely Governor’s Drive to Nasugbu, where the usual 1 hour and 42 mins will be reduced to 44 mins, equivalent to 56% time savings, and the Sta. Rosa to Tagaytay Route, where the usual travel of 2 hours will be reduced to 46 minutes, equivalent to 62% time savings. Also, vehicle operating cost for Class 1 vehicles will decrease by 12% on opening year due to the shortened travel time. Aguinaldo, Amadeo, Mendez, Alfonso, Magallanes, Nasugbu), and two spur roads (Tagaytay and Tuy), and is estimated to cost P22 Billion including right of way. “Our objective in proposing this road is connectivity, providing thousands of motorists an alternative route to and from region 4A. It is a sensible connection to CALAEX, as both alignments will decongest traffic in Cavite, Laguna and Batangas. More so, it will spur jobs generation brought about by tourism, trade and commerce. This awarding of the Original Proponent status of CTBEX is just the beginning, we are cognizant that this proposal will still be subject to NEDA approval, successful negotiation with DPWH on the terms of the concession and lastly, a Swiss challenge; all of which should be completed by the 2nd quarter of 2019, and subject to the acquisition of the right of way, 2020 is the target date of construction ” said Luigi Bautista, President and CEO of Metro Pacific Tollways South. 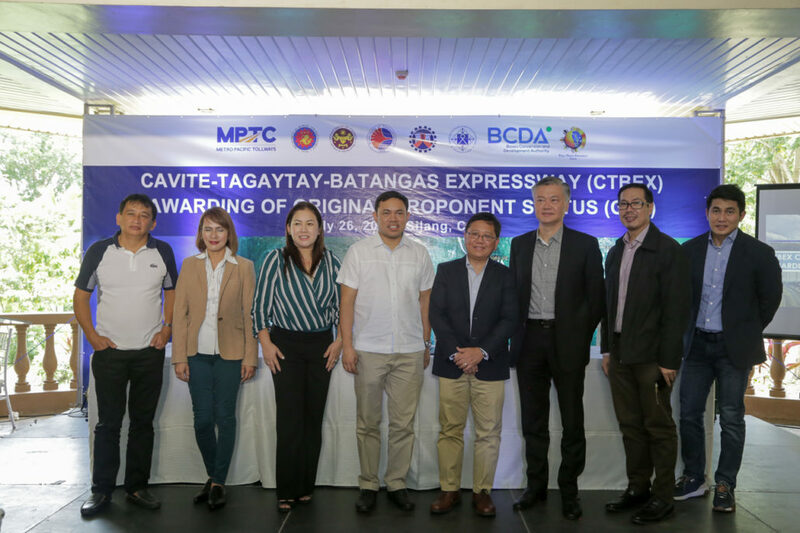 “Once completed, CTBEX will be the preferred route for motorists going to Tagaytay and Nasugbu from Manila and vice versa as this will seamlessly connect to CALAEX and CAVITEX”, added Mr. Bautista. MPT South Corporation is currently constructing the Cavite Laguna Expressway which will connect to Cavitex and the C5-Southlink that will enable transfers from Laguna, Cavite, Manila, Las Piñas, Parañaque and Taguig to be seamless.